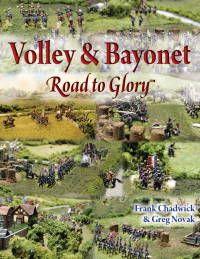 Battles of the American Civil War was was the first scenario book for Volley & Bayonet and was published by GDW in 1995. It remains an excellent work and highly sought after by players intending to use Volley and Bayonet for American Civil War gaming. The scenario book provides ten historical scenarios. These five five eastern scenarios being: Second Manassas (1862); Antietam (1862); Brandy Station (1863); Gettysburg (1863) and Third Winchester (1864). The remaining five scenarios are from the western theatre and are: Shiloh (1862) ; Stones River (1862); Champion Hill (1863); Chickamauga (1863) and Franklin (1864). Overtime however some errata became available, much of which was provided by Greg Novak. I have assembled much of this errata into one file which I hope will be useful to those people planning to refight some of these excellent scenarios. The file can be downloaded from the Scenario Errata section. This file has been updated on the 8th March and now includes a clearer map for Champion Hill.